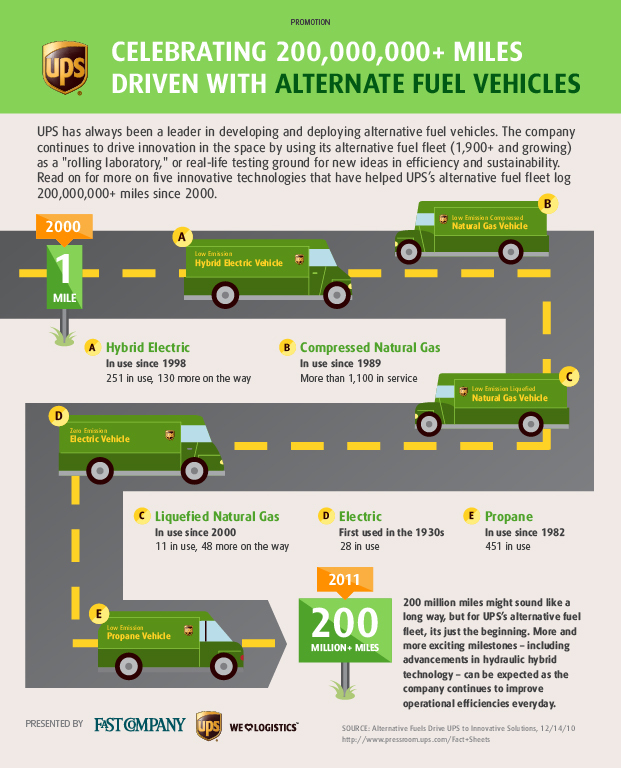 UPS has always been a leader in developing and deploying alternative fuel vehicles. From the introduction of electric delivery vans in the 1930s (28 in use today) to the addition of liquefied natural gas vehicles in 2000 (11 in use today, 48 more on the way), the company is always expanding and improving its alternative fuel fleet (AFV). Since UPS started tracking miles driven by its AFV in 2000, the company’s “green fleet” has logged over 200 million miles. That’s the equivalent of nearly three round trips to Mars or circling the Earth more than 8,600 times. UPS estimates that its AFV (1,900+ and growing) will drive the next 200 million miles by 2017. Read on for more on five innovative technologies that have helped UPS hit this exciting milestone.